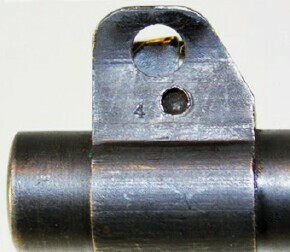 The end of the barrels were machined to a slightly smaller diameter to accommodate the front sight. This down turned area was approximately 1.5" in length. An oval keyway running lengthwise was cut into the top of this area. 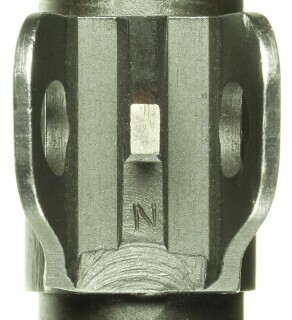 Most keyway's were oblong but a few barrel manufacturers cut the keyway in an I shape. An oblong key slides lengthwise into either keyway, the front sight slides tightly over this key. 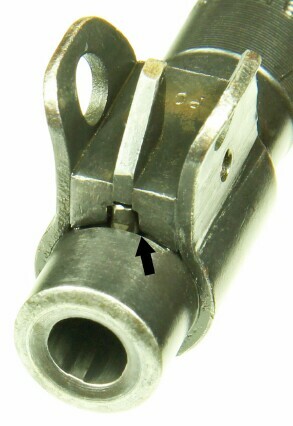 The front sight's pin hole aligns with a notch in the top of the key. 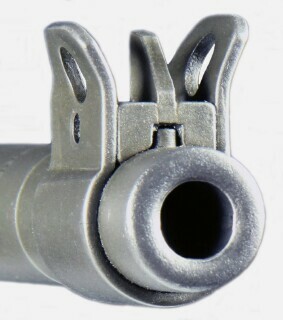 The front sight pin engages the front sight and key to hold the front sight in place. Irwin-Pedersen, Saginaw Gear in Grand Rapids, National Postal Meter, Standard Products and IBM. The exact location and orientation of the N varied, sideways it appears to be the letter Z (see pic directly below). Machining of the area between the sight blade & shooter varied between manufacturers and sometimes changed. 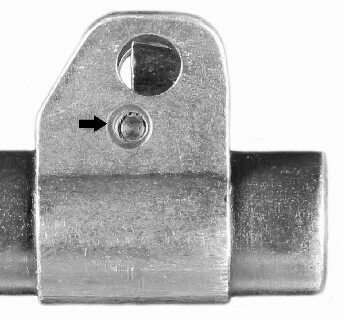 Not all milled front sights have a manufacturers mark. Those that did, it may be on top, on the front, on the rear, or on the outside of the right wing. Second from the left, what appears to be the letter Z is actually a sideways N. Far right, JQ was manufactured by the O.D. Jennings Co. of Chicago, IL for Quality Hardware. 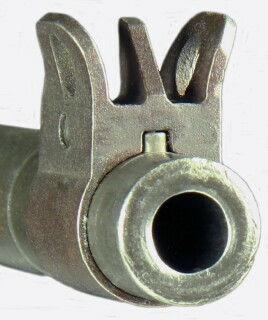 Note the difference in thickness of the metal surrounding the barrel and forming the two ears from that of the milled sights. 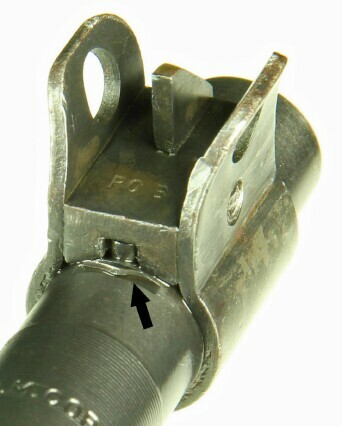 The front sight pin was staked in place using one of several different methods. 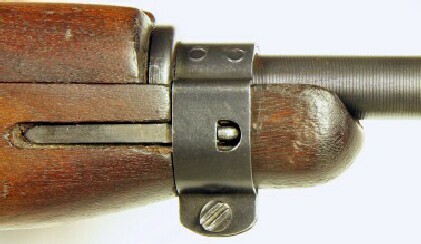 The front sight key was sometimes staked to the barrel fore and aft of the key. PO B was manufactured by the Prestole Division of Detroit Harvester in Dayton, OH for IBM. 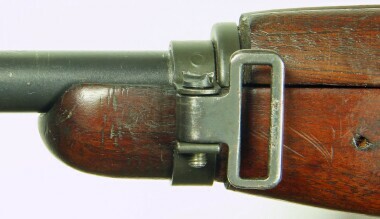 Occasionally the rear of the front sight was staked to the front sight key. some front side blades were later filed down by those in possession of the carbine to increase elevation. As issued (left), filed down (right). 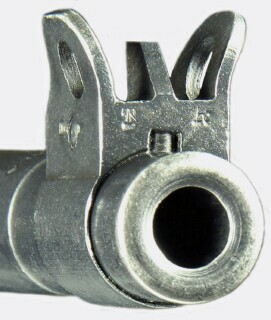 Refer to the overhead photo of the 4 milled sights (above) for additional examples. All barrel bands were made by welding two bands together. 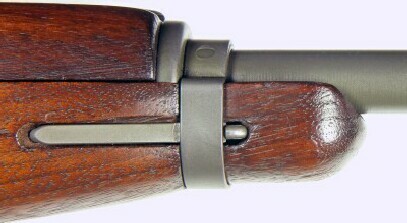 The inner band (A) engaged the handguard and barrel. and barrel together. 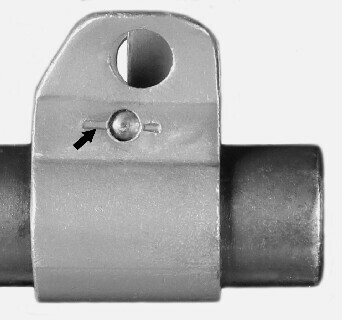 A swivel rounded out the barrel band assembly. Weld marks are visible on top of the outer band. 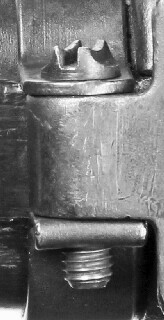 Location and shape of the weld marks varied from one manufacture to the next. 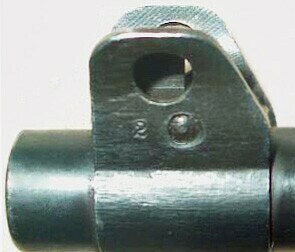 swivels used on the narrow barrel band. 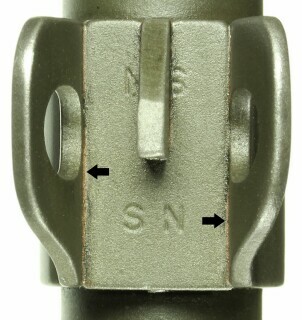 The two types of wider barrel bands that followed use a wire swivel with no markings. 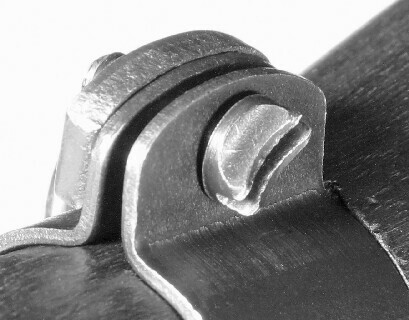 The head of the barrel band screw has a very unique design allowing it to be removed or installed using the lower edge of a .30 Caliber cartridge casing. manufactured for U.S. Army Ordnance during or after WWII. The earliest barrel bands used were .40" wide. The opening for the sling was 1/4" wide. 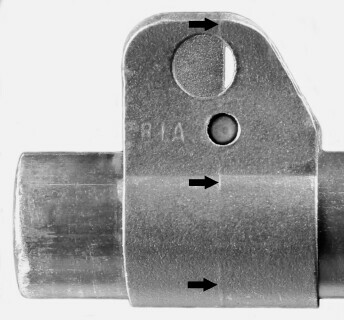 Early swivels had a sling opening 1/4" in width (left) and were soon replaced with a swivel having a wider sling opening of 5/16" (right). 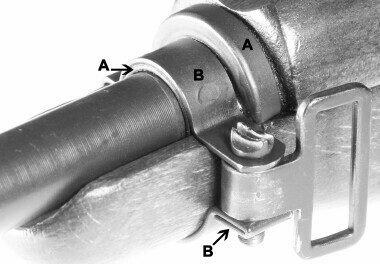 Manufacturer codes, when present, sometimes appeared on the swivel in addition to, or instead of, the barrel bands. First Barrel Band, second style swivel with sling opening widened to 5/16". Swivel marked KV B manufactured by Knapp & Vogt Manufacturing Co. of Grand Rapids, MI for IBM. The earlier barrel band was superseded in 1944 by a barrel band .70" wide that held the barrel and stock together more securely. is single \ used as a manufacturer's mark. 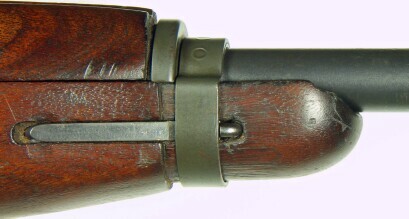 The outer band of the third style barrel band remained the same as the band used prior. 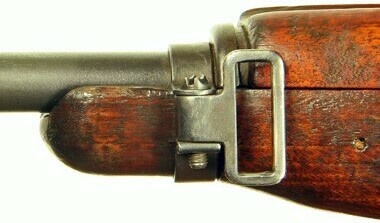 The inner band was extended farther forward ending with a bayonet lug for the M8 bayonet. of carbines after WWII. Manufacture of this style barrel band continued post WWII and well into the 1960's. manufacture and use regardless of whether or not a bayonet was attached. Manufacturer marks were placed on the left or right side of the outer band. 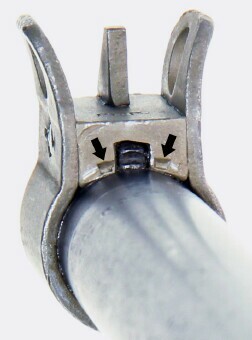 found on the bottom of the bayonet lug identify the separate company who manufactured the inner band. production. They subcontracted the manufacture of both the outer and inner band in addition to the quantities produced by Quality Hardware. Quality Hardware on their carbines. If one is present on a Quality Hardware carbine it was used as a replacement. a slight lip under the front of the band. 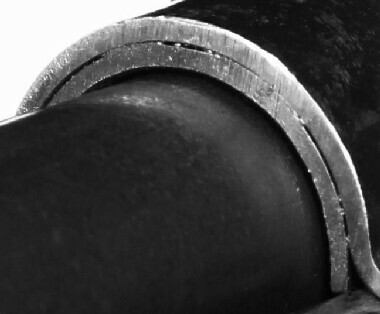 Note the saw marks across the front of this band. The early type I barrel bands are usually of far more interest to collectors with a value equal to their rarity and condition. The significantly less expensive type III barrel band with the bayonet lug provides a far more secure method of holding the barrel band to the barrel, stock and handguard without shifting and therefore provides far more reliable and better accuracy than the narrower barrel bands. 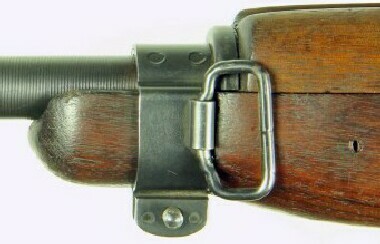 The type I barrel band was known to shift it's position and alter a carbine's accuracy during firing and particularly if the swivel had a sling attached that was drawn tight to aid in sighting.